August and Catherina Lux. 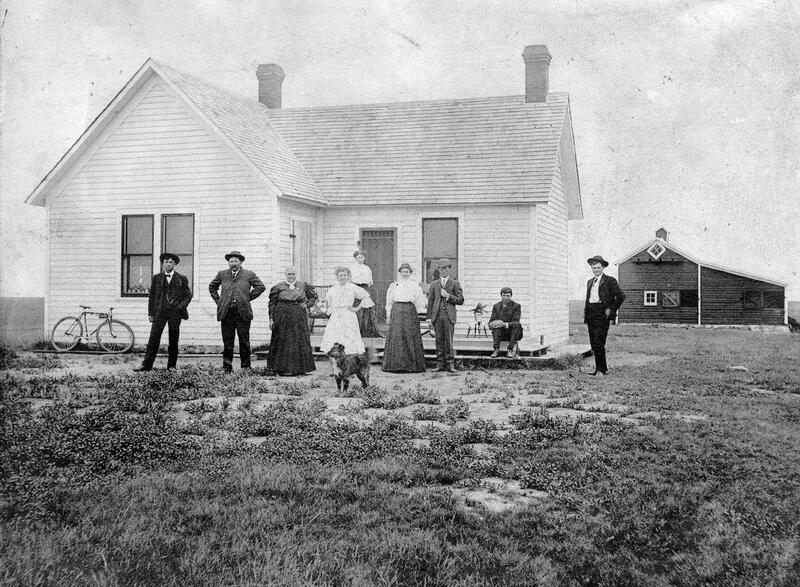 Detail of a family portrait taken at the farm in Bowbells, N.D. Early 1900s. 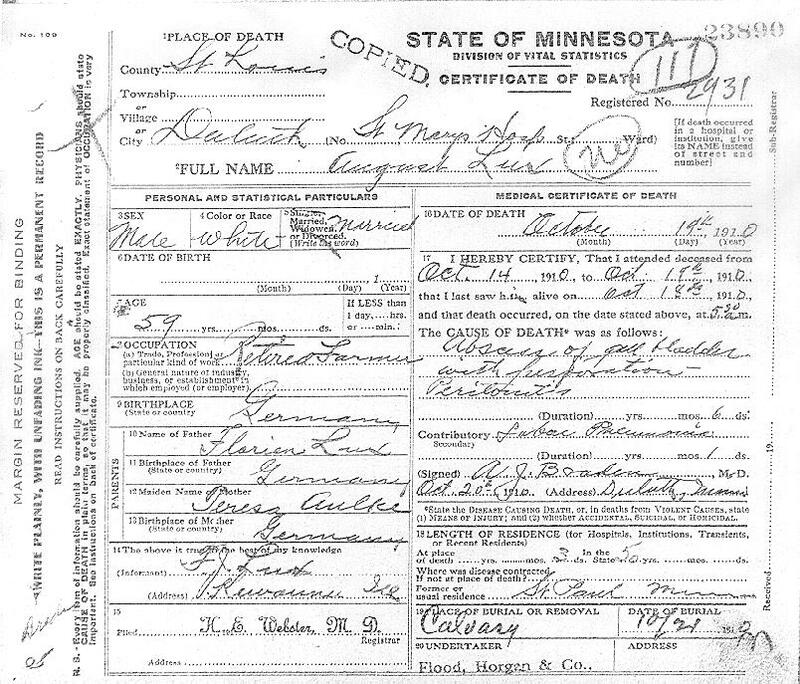 Died: 19 Oct. 1910, Duluth, Minn.
Died: 14 June 1931, St. Paul, Minn.
Married: 22 Feb. 1876, Jordan, Minn. Photos and some information provided by Holly and Rick Johnson, Lincoln, NE. Some information provided by Barbara Rauch, San Diego, CA. | Agnes A. B. 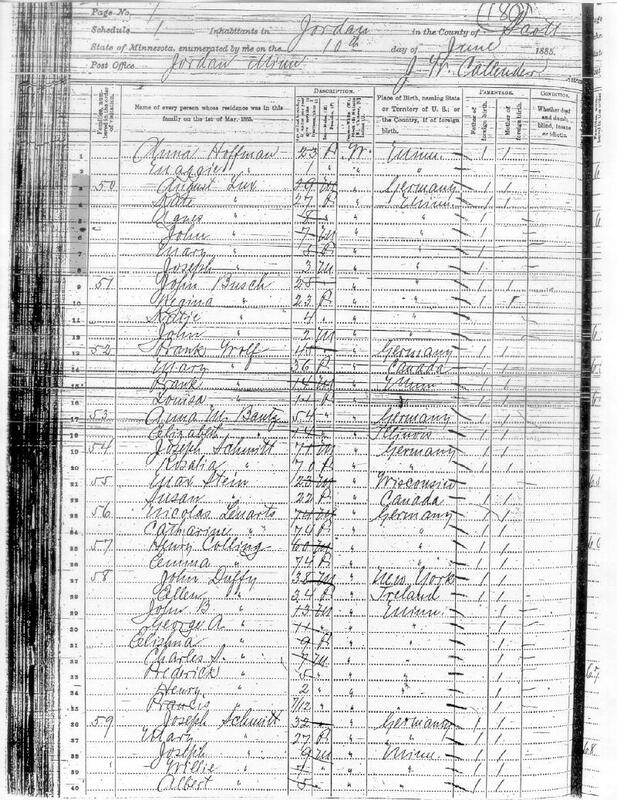 21 Jan 1877     D.
| John                   B.    Aug 1878     D.
August Lux       \    | Mary                   B. about  1880     D.
| Katherine Regina       B.    Mar 1891     D.              Billings MT? 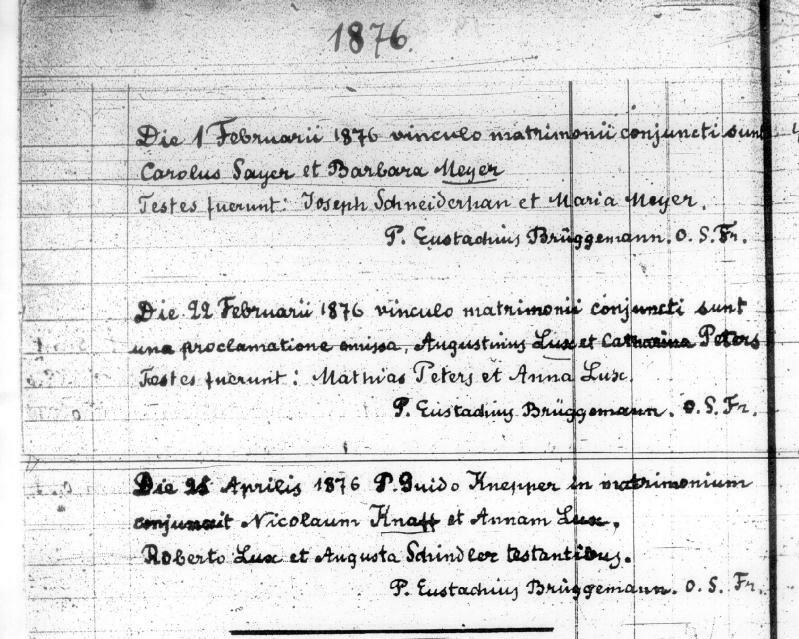 August was the eldest son and second child of Florian and Theresia Lux, born in Prussia in 1852. He was only an infant when the family moved to the United States, where they settled in Scott County, Minnesota, a few miles south of Jordan, in 1854. When he was 23, he married Catherina (Kate) Peters whose family lived on a nearby farm. They had six children, all apparently born in Scott County. In about 1900 August and Kate moved to a farm near Bowbells, North Dakota. Sons John, Joe (Frank Joseph) and Nick also purchased property near Bowbells. Joe married Ann Marie Wenker whose family lived nearby. Agnes Lux married Frank Vosen, who owned property just to the west of August. John was said to be mentally retarded and never married, so his 40 acre parcel, which adjoined August's, was probably farmed by his father. Katie married Peter Phillips (or Phillip) on April 5, 1910 in Duluth, Minnesota, when she was 19. She gave birth to their daughter, Beulah Catherine, on Sept. 17, 1910, also in Duluth. Katie later divorced Mr. Phillips and married Lawrence Kroll, though dates have not been located. 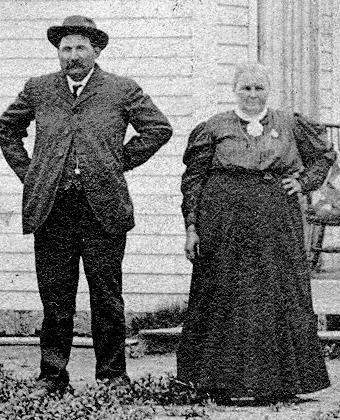 August and Kate sold the farm near Bowbells in 1908 and moved to St. Paul, Minnesota. They lived for a short time in Hampton, Minn. (about 25 miles south of St. Paul), then moved to Duluth to be near their daughter Katie (Mrs. Peter) Phillips in about August of 1910. 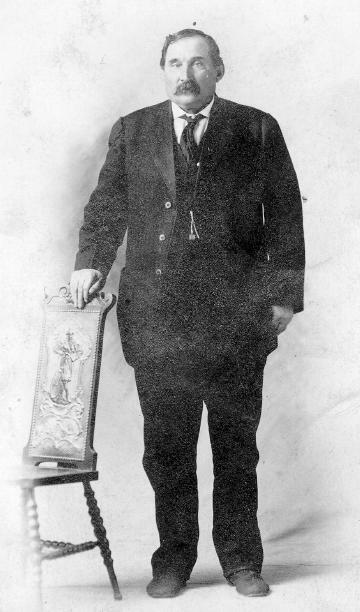 August died of an abcess of the gall bladder on October 19, 1910, in Duluth. He was buried in Calvary Cemetery there. His grave is unmarked. 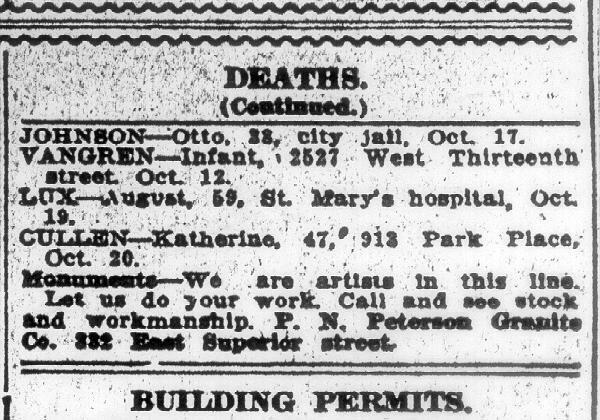 Catherina died in St. Paul on June 14, 1931, and is buried there. 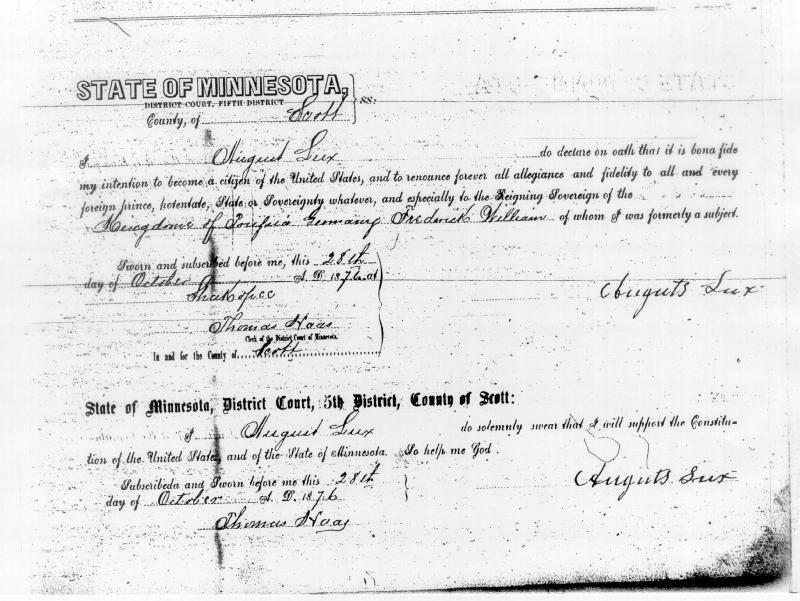 August Lux citizenship certificate, Oct 28, 1876. Mae (?) (on porch), Agnes and Frank Vosen, John and Joe. 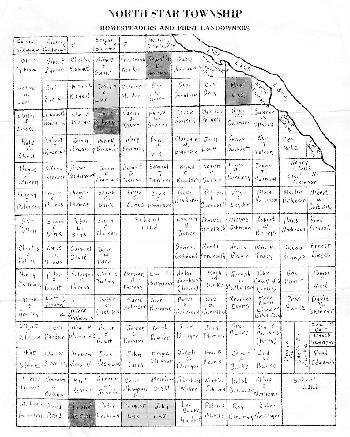 RIGHT: Map showing Homesteaders and First Landowners in North Star Township, ND. Greyed areas show Lux family and associated properties.